This book presents a geographical analysis of the new Russia which has emerged from the ruins of the Soviet Union since 1991. 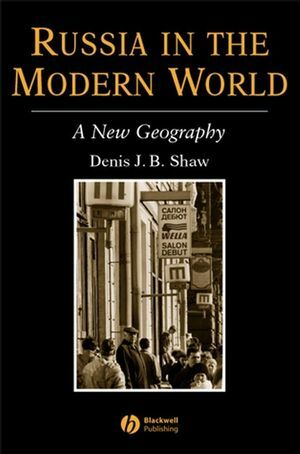 Denis Shaw is Reader in Russian Geography in the School of Geography and Associate Member of the Centre for Russian and East European Studies at the University of Birmingham. His previous books include Planning in the Soviet Union (with J. Pallot, 1981), Landscape and Settlement in Romanov Russia 1613-1917 (with J. Pallot, 1990), and The Post-Soviet Republics: A Systematic Geography (Editor, 1995). ONE The Territorial and Imperial Heritage. FOUR The Command Economy and the Transition to Capitalism. FIVE The Changing Space Economy. SEVEN Population: Urban and Rural Life. EIGHT The Regions of Russia. TEN Russia and the 'Near Abroad'. ELEVEN Russia and the Wider World. 'Now, we have a single author book which brings together the research of systematic specialists into a coherent whole which interprets the rapidly changing world of the Russian Federation for an undergraduate audience...and reminds Russian specialists that there is a geographical element to the "transition" and geographers that the post-communist world is a rich field for geographical wnquiry.' Dr. Judith Pallot, School of Geography, University of Oxford. Provides the first comprehensive geographical analysis of Russia since 1991. Examines Russia in the context of its past, in relation to its post-Soviet neighbours, and in an international context. Focuses on economic, political and social geography; rural and urban spaces; and ecological issues.